Join Us as TAME Coalition raises public awareness showing Montgomery Village residents what they will lose if Mid-County Highway Extended (M-83) is constructed. Click here for link to: m83walks.weebly.com for full description on Walks in Montgomery Village and to pre-register your group on line. What will you do to help? We hope you’ll Join Us. On all three Walks, Montgomery Village residents will see the location of their homes, property and community, in relation to the destruction caused by proposed M-83. Match the circled numbers on the map to the corresponding numbers on the (below) Legend. Red Line in middle of map is proposed 6-lane M-83 highway. 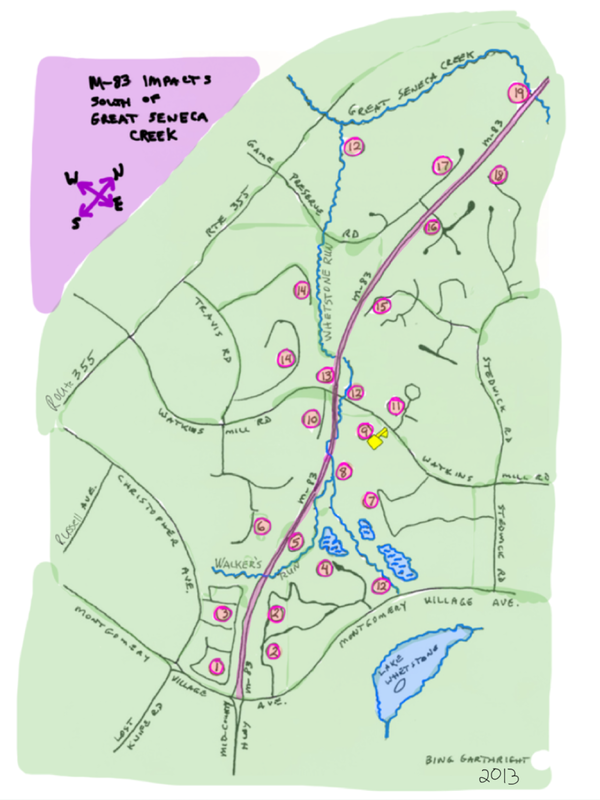 Clusters I of Stedwick HOA, Watkins Mill Dr.